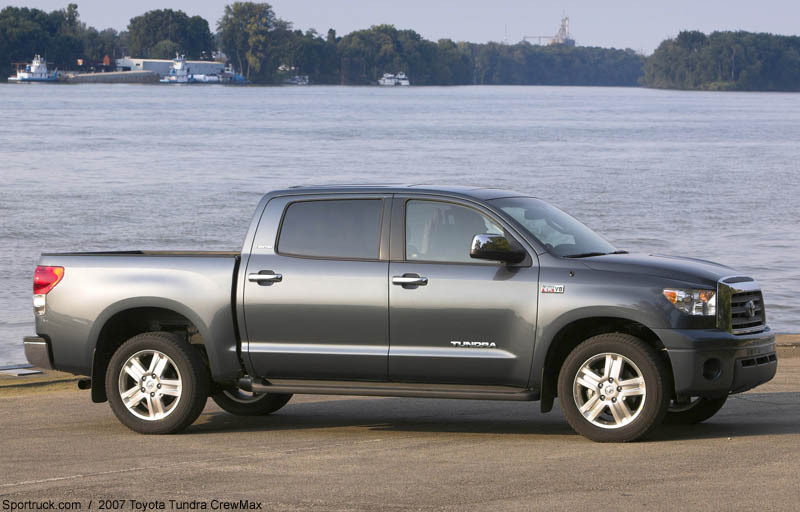 Toyota unveiled the new 2007 Tundra CrewMax at the North American International Auto Show in Detroit. Scheduled to arrive in March, this four door full-size pickup will follow the Regular and Double cabs arriving at dealerships this month. 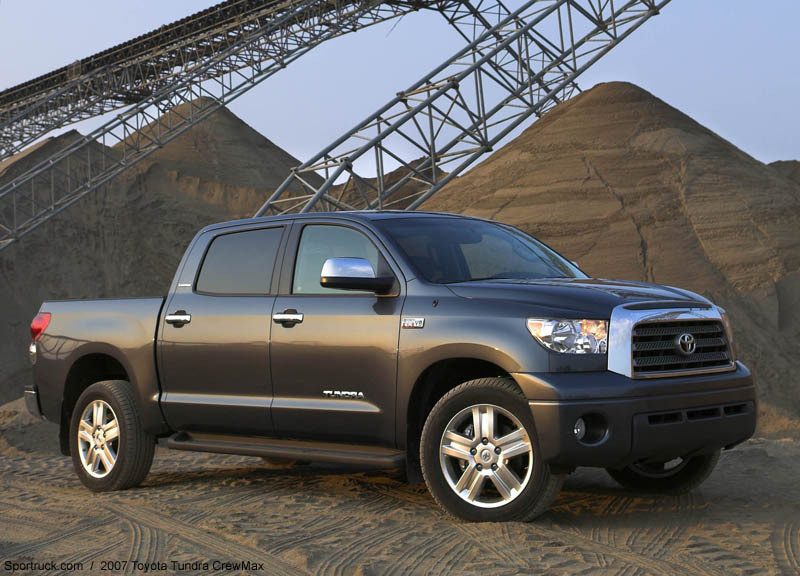 Toyota plans the new Tundra to make a large impact on the Domestic truck market. The new truck was designed from the group up to be a leader in performance, features and style, and a true competitor among its domestic rivals. 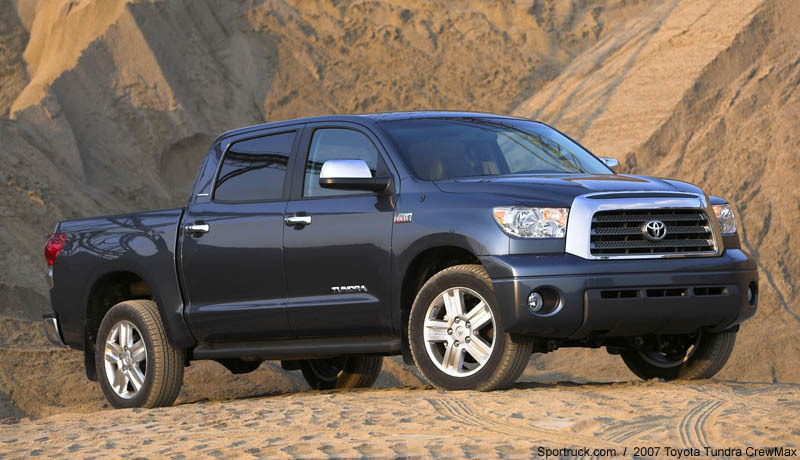 To that end, Toyota has both designed and is building the truck entirely in America. The truck has been scaled up to fit among its domestic competition, increasing in size in every dimension from the previous model. 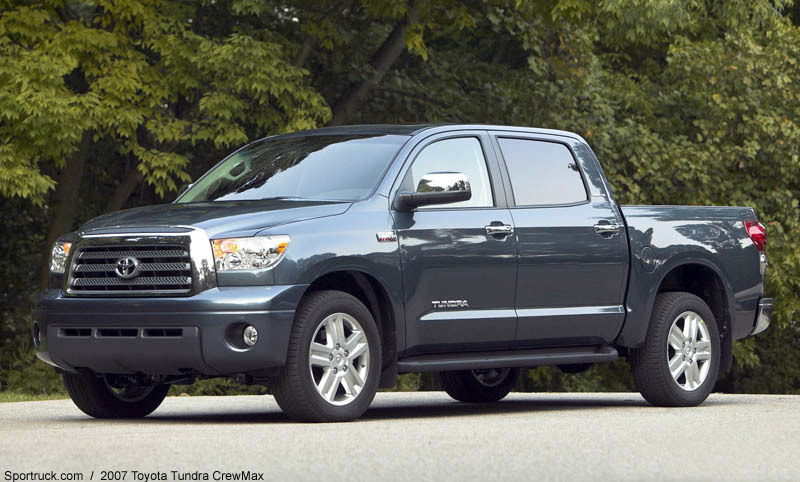 The Tundra lineup will offer more choice than ever before with 31 unique configurations. Each truck can be configured in 2wd or 4wd drivetrain, and includes one of three cab styles, three bed lengths, three engines, and three trim levels. With so many choices there is bound to be at least one truck for every purpose, be it a work truck, a family hauler, or a weekend recreational truck. To fit its larger scale and purpose, the Tundra has been given an even more distinct style, with large, bulging fenders and a bold chrome grille. The truck is right up there with Dodge in terms of having the most imposing nose. The brawny look is backed by true performance thanks to a new 381-horsepower V8 engine. 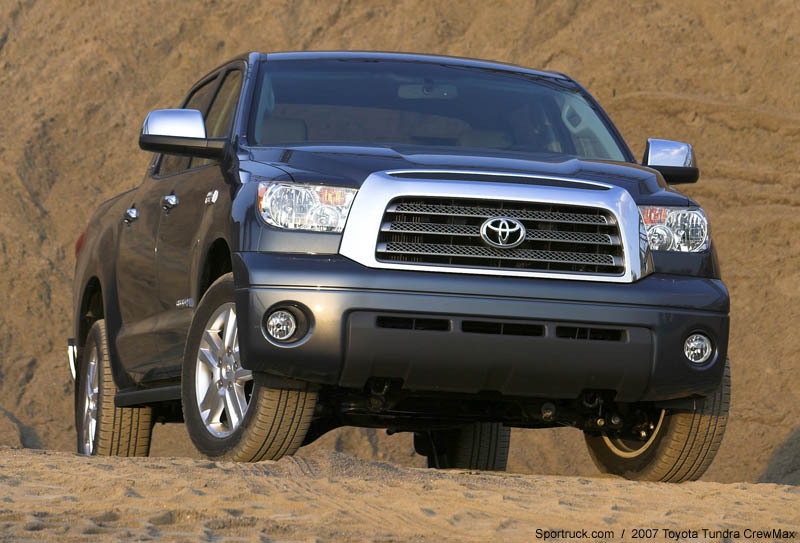 The new 2007 Toyota Tundra is offered in three power levels: Regular and Double Cab models come standard with a 4.0-liter V6 engine capable of 236 horsepower at 5,200 rpm and 266 lb.-ft. of torque at 4,000 rpm. 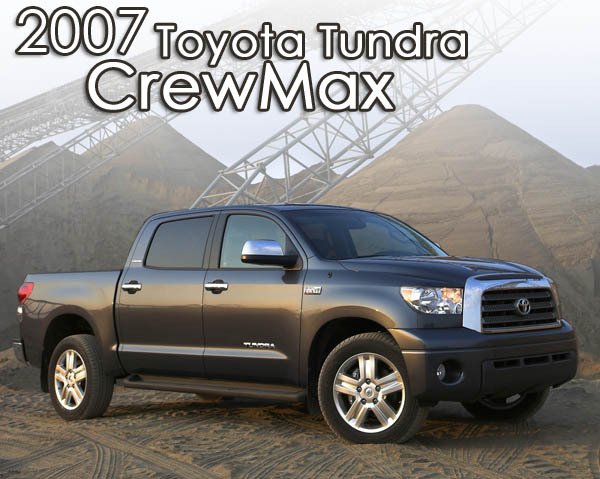 These models can be upgraded to the larger 4.7-liter engine that is standard on the CrewMax model. 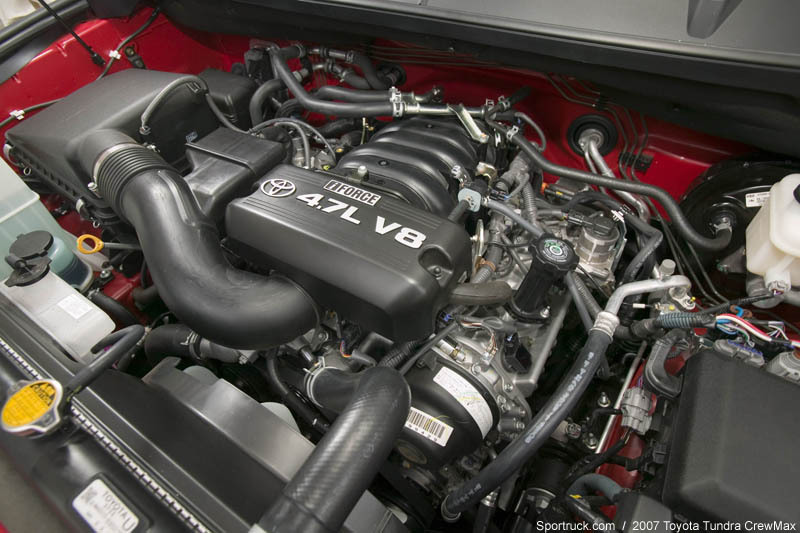 That engine is an enhanced version of the existing Tundra's 4.7-liter i-Force V8, with output of 271 horsepower at 5,400 rpm and 313 lb.-ft. of peak torque at 3,400 rpm. Both engines feature dual overhead cams and 4 valves per cylinder with variable valve timing. 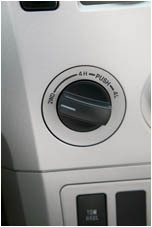 The combination produces power across a wide operating range. Both engines are offered with a five-speed automatic transmission. An updated flex lock torque converter to enhances response and efficiency. In addition, the five-speed transmission features shift logic for increased uphill / downhill performance. Models equipped with the efficient 4.0-liter engine have estimated mileage of 17 mpg city and 20 mpg highway. 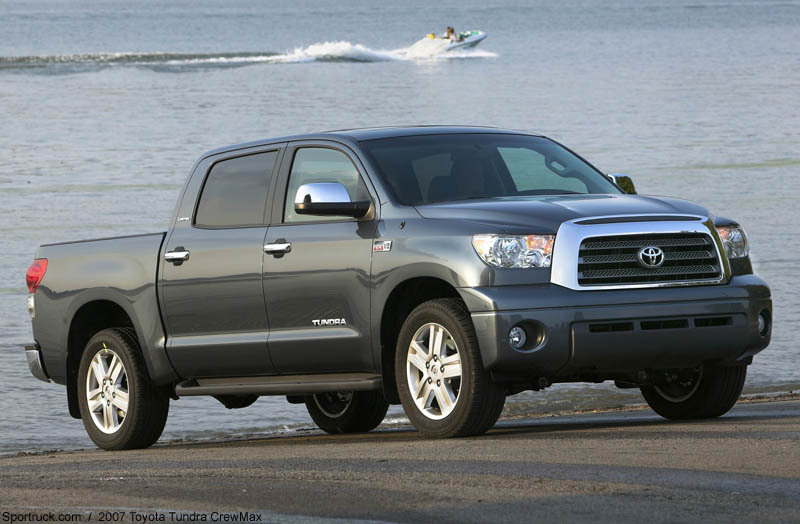 The Tundra equipped with a 4.7-liter engine offers 15 city and 18 highway fuel economy ratings. 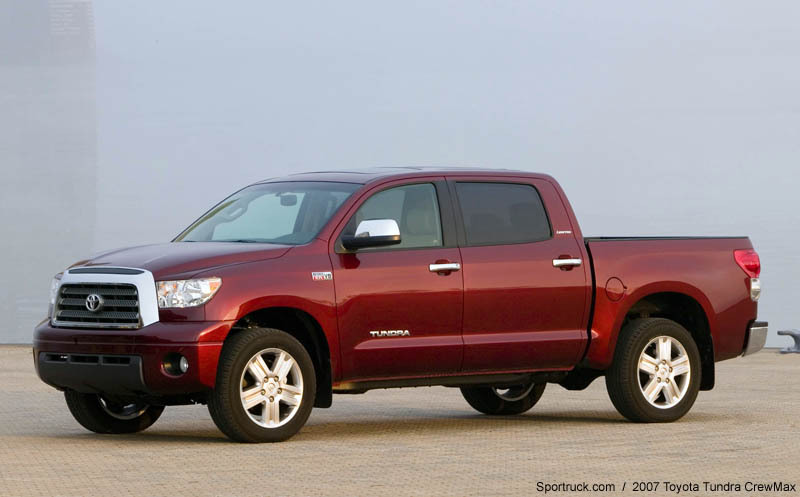 The most exiting performance feature of the new Tundra is the i-Force V8. The engine plants the truck firmly in the "real truck" category, boasting 5.7 liters of displacement, and available in every model configuration. The engine is a true long-stroke configuration, with a stroke of 4.02 inches, it is longer than its 3.70 inch bore. The engine pumps out 381 horsepower at 5,600 rpm, and a total of 401 lb.-ft of torque at a very usable 3,600 rpm. Both the engine heads and block are aluminum on the i-Force V8. Dual overhead cams and advanced Dual VVT-i controls valve timing and overlap, with independent control over intake and exhaust valves. When installed in a 4x2 Tundra, the 5.7L i-Force will have 16 mpg city and 20 mpg highway fuel economy ratings. The 4x4 model will see a 2 mpg decrease in fuel economy from these numbers. All engines use an Acoustic Control Induction System incorporating butterfly valves inside the intake manifold. The valves change the length of the intake tract depending on rpm and throttle, to maximize torque throughout rpm range. 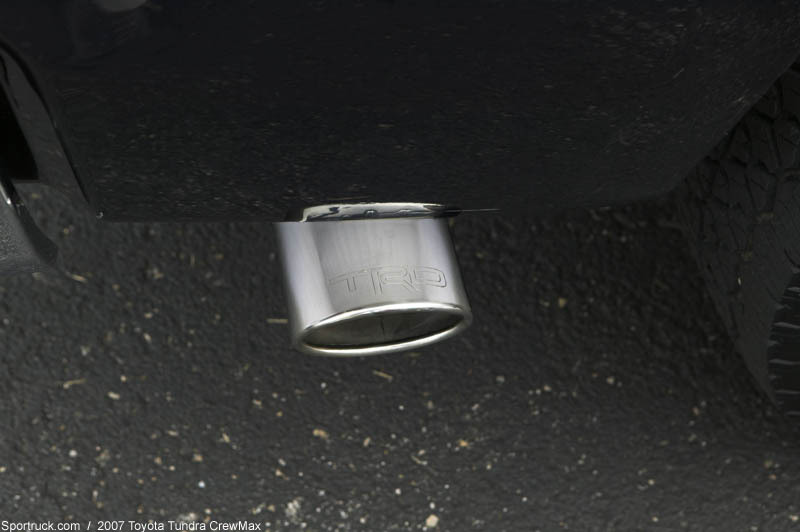 Additional features include tubular stainless steel headers, a full stainless steel exhaust system, and mufflers designed for a healthy and powerful sound. Trucks equipped with the i-Force V8 are offered exclusively with a new six-speed automatic transmission. 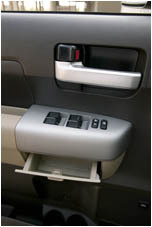 With use of Shift logic, the transmission adapts to driver input. 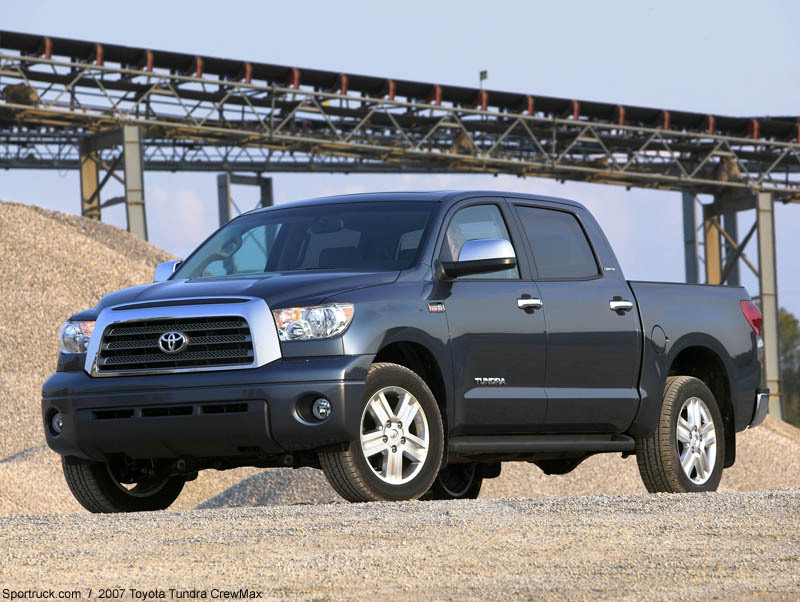 Starting in 2008, the 2009 model Toyota Tundra equipped with the 5.7-liter V8 will offer E85 ethanol flexible fuel capability. 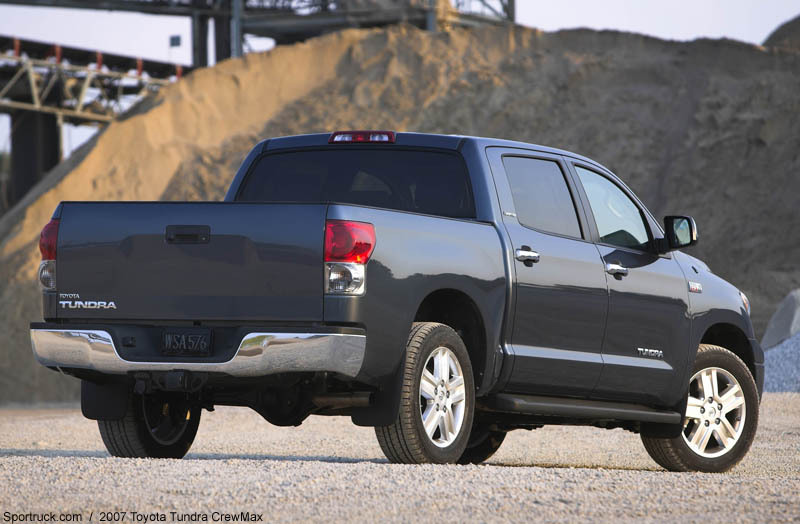 The 2007 Tundra rides on a new frame designed for serious work. The various combinations of cab and bed size result in three distinct wheelbase lengths. The shortest is a 126.8 inch wheelbase on the regular cab with standard bed, and extends to 145.7 inches for the regular cab with long bed, as well as the double cab with standard bed and CrewMax short bed models. The largest wheelbase is a gigantic 164.6 inch wheelbase found on the Double Cab with a long bed. The Tundra uses what is called a TripleTech frame, incorporating wide and fully-boxed frame rails from the front of the truck to the back of the cab. Behind the cab the frame transitions to a reinforced C-channel construction underneath the bed. The new frame uses high strength steel of a larger steel gauge than previous models, and also incorporates beefier suspension mounts. The suspension consists of double A-arms in front with coil spring over shock units. The rear suspension features traditional leaf springs with the shocks mounted outside the leafs to increase shock dampening. 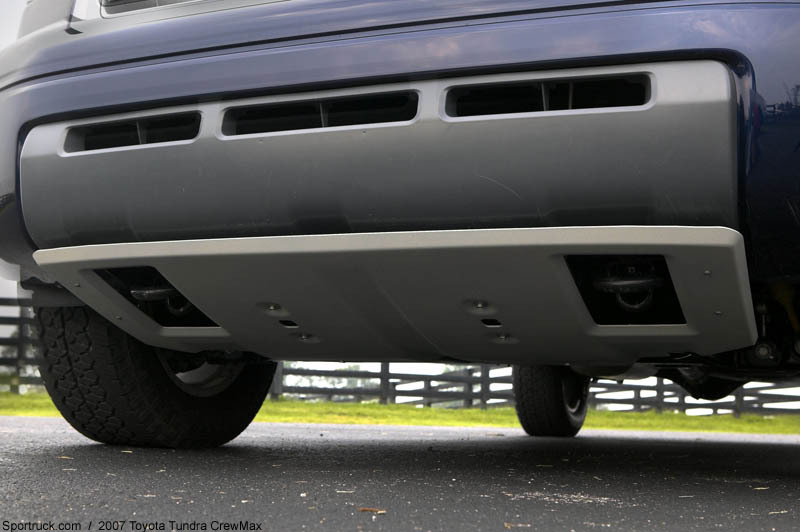 Spring rates were chosen for both ride comfort and load capacity, and provide a flat vehicle stance when fully loaded, while spring toe-out mounting provides towing stability. Progressive bump stops keep heavy loads under control. Not to be outdone by the competition, the Tundra is equipped with giant standard wheels, measuring 18x8 inches and wearing 255/70R18 tires. Upgraded models feature aluminum-alloy wheels with wider 275/65R18 tires. 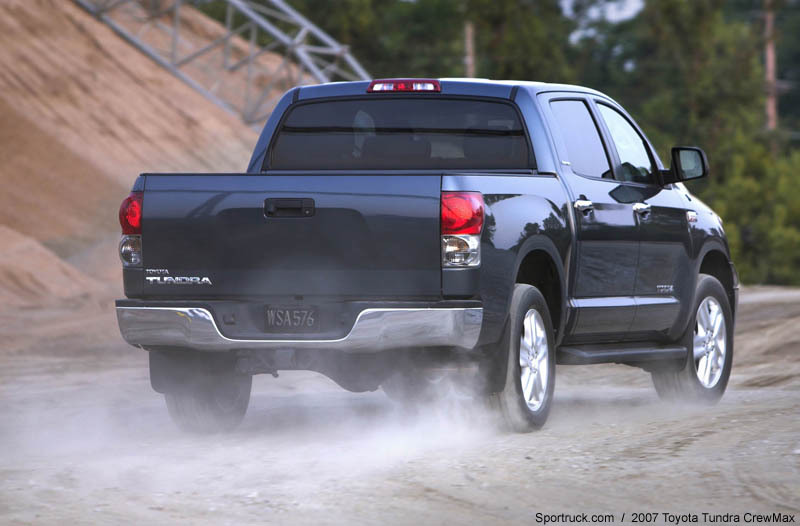 Top of the line trucks can be fitted with optional 20-inch alloy wheels and 275/55R20 tires. The new Tundra if offered with a TRD (Toyota Racing Development) Off-Road Package. This includes Bilstein gas-charged mono-tube shock absorbers, exclusive 18-inch alloy wheels wearing 275/65R18 BF Goodrich all terrain tires, fog lights, and a TRD graphics package. 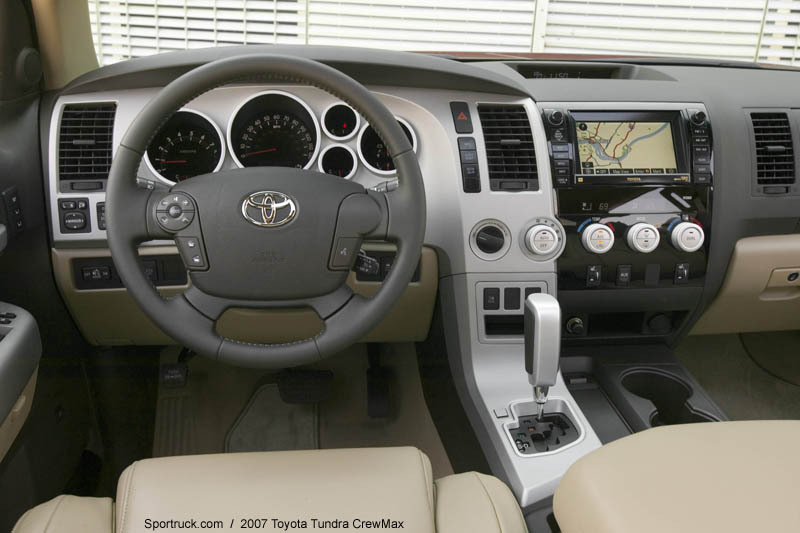 Toyota includes advanced brake and traction control systems as a standard feature on all Tundra models. The brake system features four-wheel disc brakes with large ventilated rotors both front and rear. The front brakes measure an impressive 13.9 inches in diameter and are 1.26-inches thick, while the calipers are of a four-piston design. The rear discs measure an equally impressive 13.6 x 0.71-inch and use two-piston calipers. Anti-lock brakes with Electronic Brake-force Distribution and Brake Assist are standard as well. Toyota uses its automatic limited-slip differential on all models to provide computer-controlled torque management for the rear axle. While the system is not a true locking rear, it is able to limit wheel-spin to provide better acceleration in deep sand or mud and on low traction surfaces. In addition to the limited-slip, Vehicle Stability Control (VSC) is also standard equipment. 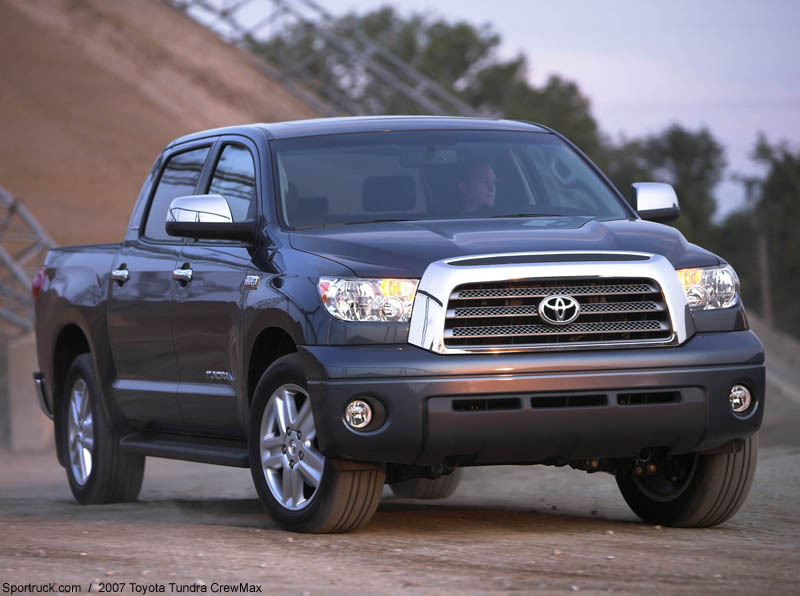 The Tundra's VSC system integrates traction control keep the truck going on its intended course. The system detects front and rear wheel slide when cornering and can intervene by controlling throttle and/or braking individual wheels. The driver can select the level of assist, ranging from "Normal" mode for maximum traction and stability control, "TRAC Off" mode to use only the limited slip differential, or "VSC Off" mode to turn off all systems. Maximum towing capacity is 10,800 lbs when equipped with the optional tow package and i-Force V8 engine. 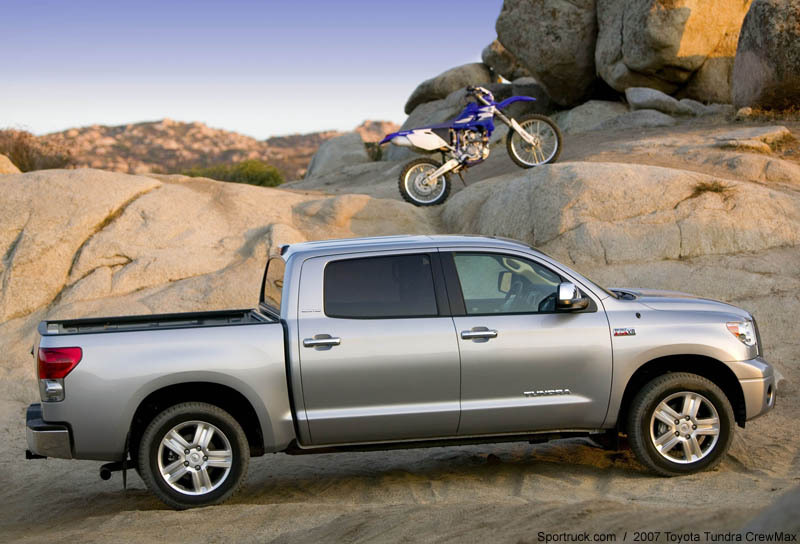 The package comes standard on Double Cab Long-Bed models. The package consists of a one-piece hydro-formed towing receiver that is attached to the frame using 12 bolts during assembly, before the bed is mounted on the truck. The springs are also upgraded to provide level suspension even at full load. 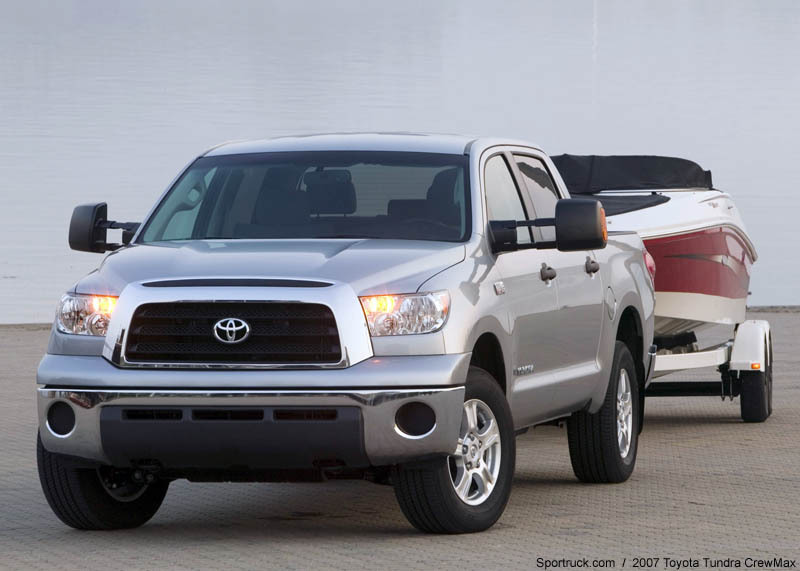 With the towing package, cooling and electrical systems also receive an upgrade. A water-to-oil engine oil cooler improves engine warm-up and reduces startup friction. 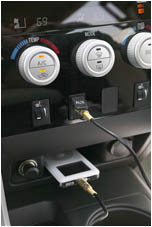 The automatic transmission fluid warmer heats the fluid quickly in cold conditions, while the instrument cluster receives transmission fluid temperature gauge. The towing equipment package is rounded with a power steering fluid cooler mounted below the radiator. The towing package electrical upgrades include a trailer brake control connector under the dash, as well as dual trailer brake connectors near the hitch (both seven-pin and a four-pin). The electrical system is upgraded to a high output alternator. Optional telescoping towing mirrors are available on i-Force V8 models. That model also receives a driver-selectable TOW/HAUL mode for its six-speed automatic transmission. This mode enables shift logic for upshift and downshift control by holding low gears when accelerating or decelerating. 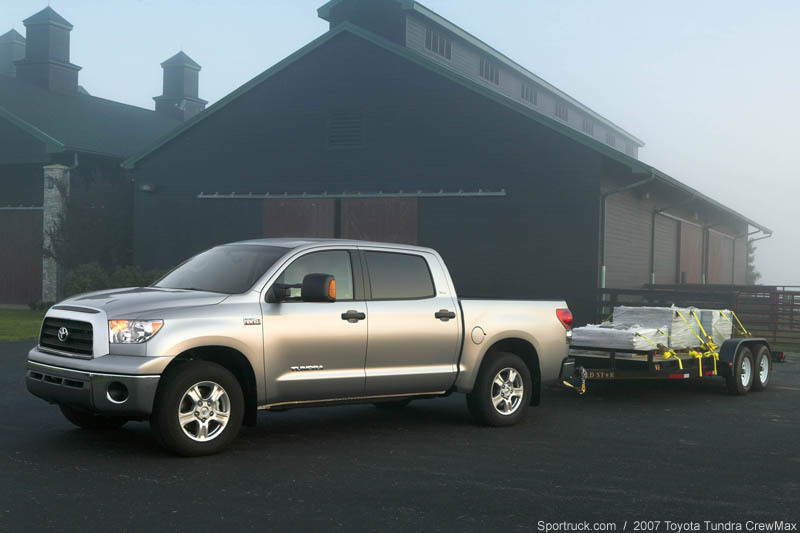 The new Tundra bed choices include a standard 6.5-foot or long 8-foot bed on Regular Cab and Double Cab models, while the CrewMax comes with a short 5.5-foot bed. 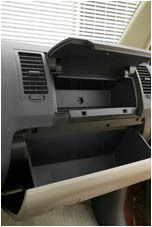 Measuring a full 22 inches deep, the bed includes a lockable all-steel tailgate. Opening and closing the tailgate can be accomplished with just tow fingers thanks to tailgate assist. A cargo lamp is also standard. The optional Deck Rail System offers adjustable tie-down locations, with 220 lb rating at each attachment point. To facilitate special cargo needs, Toyota offers a range of Genuine Accessories, from bed covers to storage boxes and Rail System accessories. 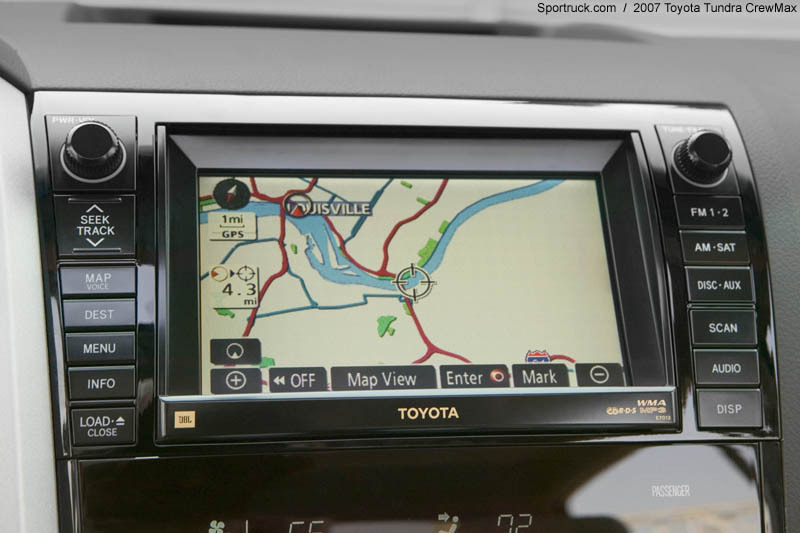 The new Tundra places driver controls easily within reach, and is designed to accommodate the demands of daily use. 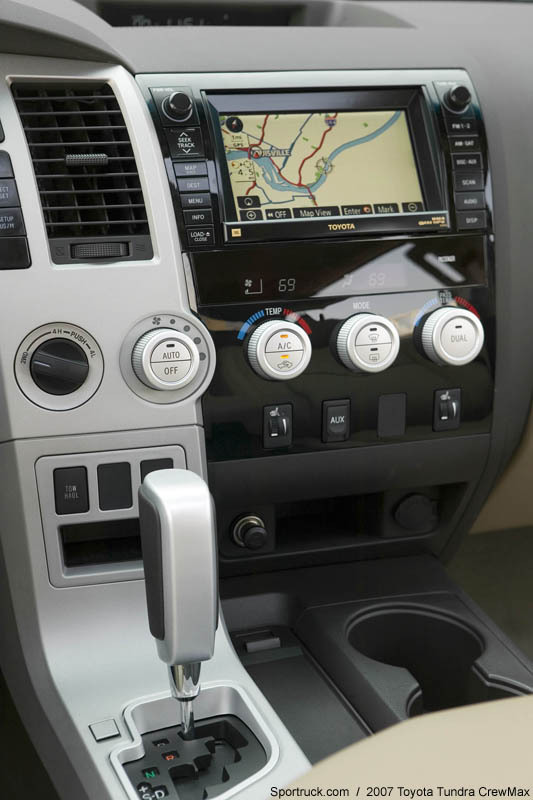 Knobs and switches are placed in a U-shaped "Command and Control" layout around the driver, and handles and knobs were designed with large, gloved hands in mind. 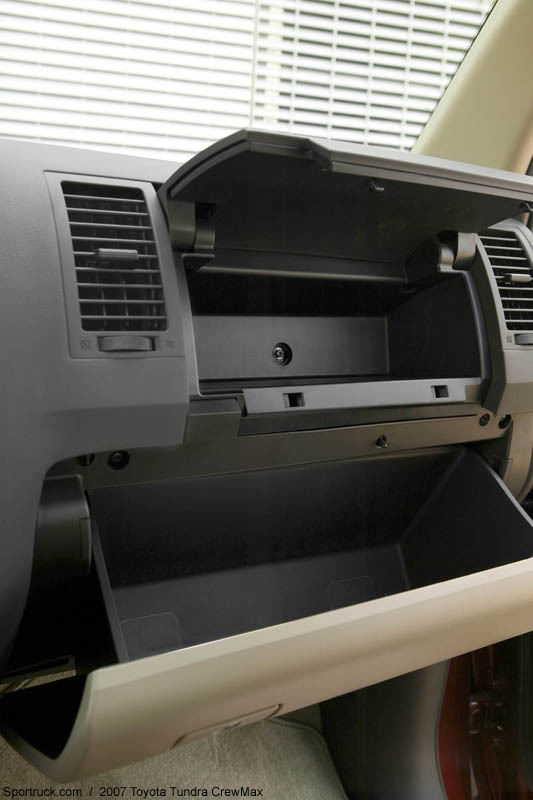 For those who use their truck as a mobile office, storage capacity has been increased and includes dual glove boxes: an upper 3.4-liter compartment in addition to the traditional lower glove box that measures 9.5-liters in capacity. 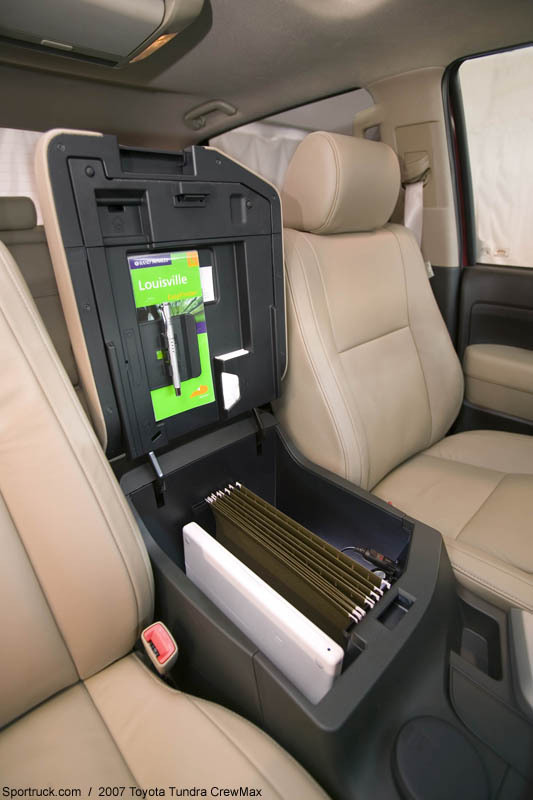 For truck equipped with front bucket seats, a center console is included capable of holding large items such as a laptop computer or file folders. The console adds a sliding arm rest to accommodate passengers of all sizes. 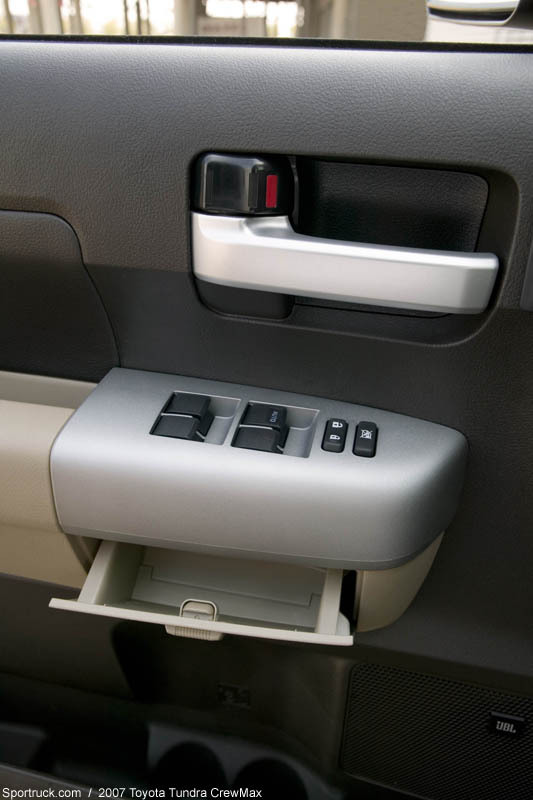 Power outlets abound, on both the dash and center console, with the CrewMax adding an additional port at the back of the console for rear passengers. The DC outlets continue to operate up to two hours after the truck is turned off. Toyota is serious about storage capacity. 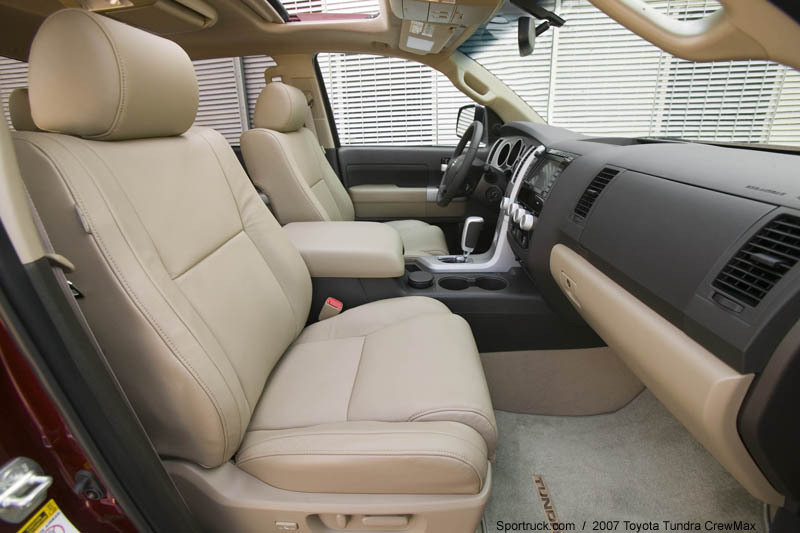 Among regular cab pickup trucks, the Tundra offers the most behind-seat storage. 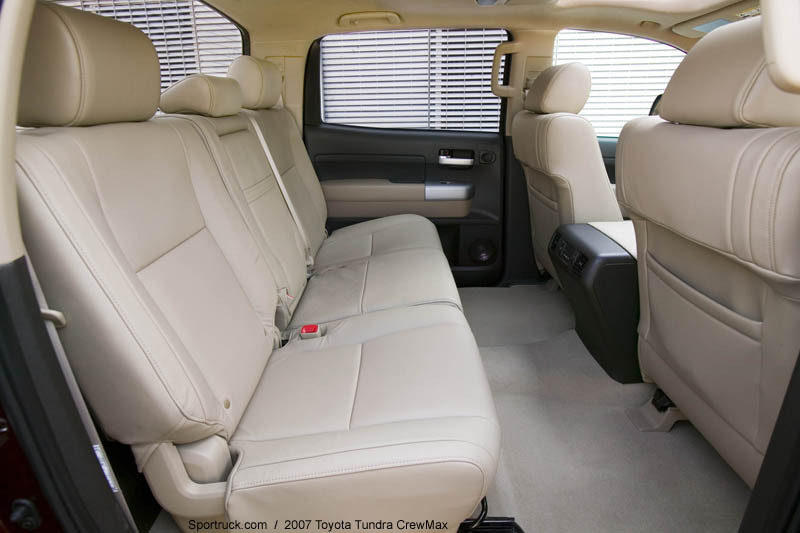 The Double Cab likewise provides a roomy rear seat with nearly three feet of legroom and an angled backrest, in addition to a normal front-hinged rear doors that open to a full 80-degrees. 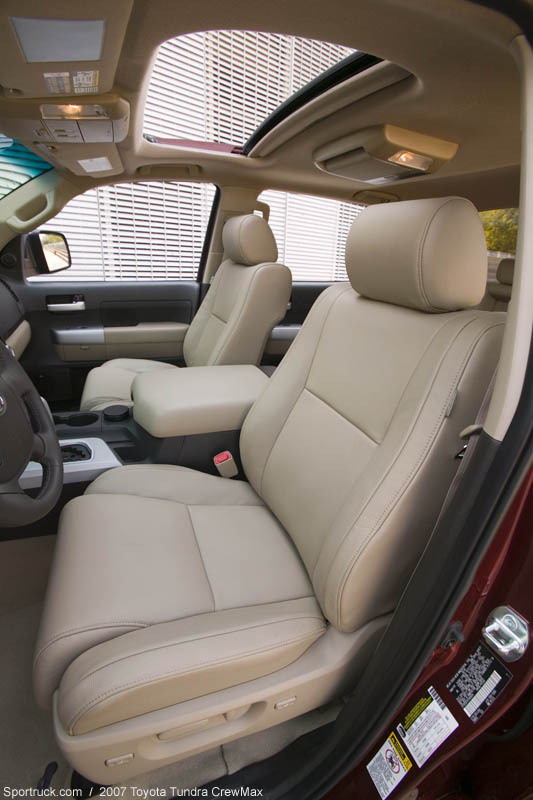 The CrewMax provides the most legroom of any truck in its segment, maxing out at 44.5 inches of legroom, and offers a rear seat that both reclines and slides to maximize utility. The seat is capable of moving 10 inches, while additional cargo can be stored under the rear seats. CrewMax Tundra offers a unique rear sliding window that retracts down into the rear cab wall, while both the Double Cab and CrewMax provide side windows that retract completely into the doors. Regular and Double Cab models offer a split sliding rear window. 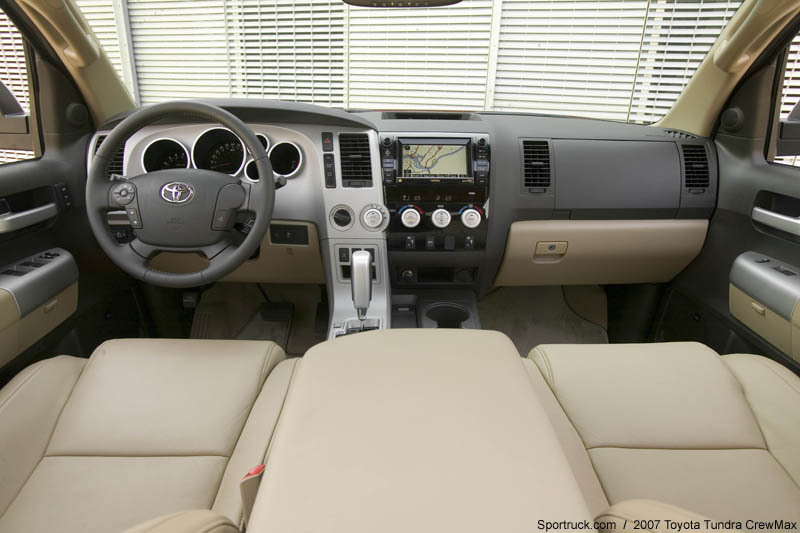 Upscale features on the Limited model include automatic dual-zone climate control with independent upper and lower controls, steering wheel mounted audio controls, tilt and telescoping steering column, retractable, heated auto-dimming side-view mirrors, heated 10-way power bucket seats, and programmable lock/unlocking functions and programmable interior light timers. 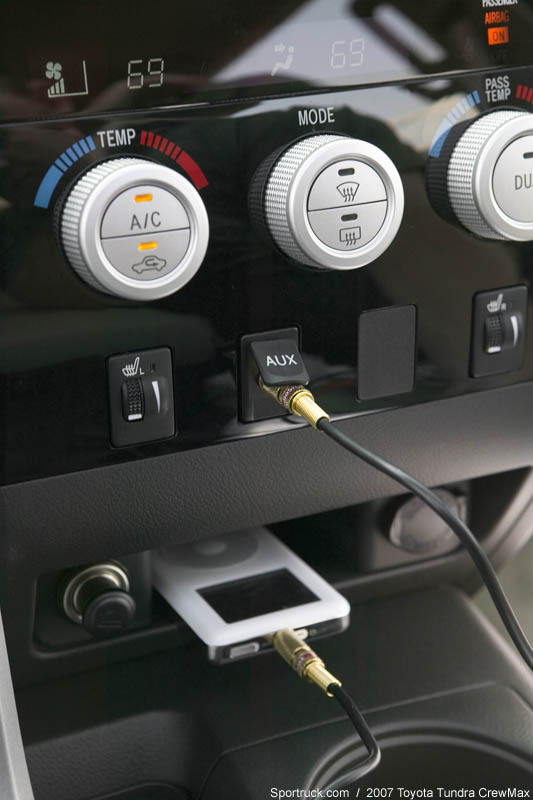 Audio systems include the entry level four speaker AM/FM/MP3/CD stereo with an audio input jack, the SR5 trim level upgrades to a six-speaker system, and the top of the line Limited uses a 440-watt JBL audio system with six-disc in-dash CD changer, 5.1 channel surround sound, and up to 12 speakers in the CrewMax. The CrewMax also offers an optional nine-inch LCD monitor with DVD player for rear seat passengers. A DVD navigation system with rear backup camera is available to show objects behind the truck on the navigation screen when backing up. The multifunction rear view mirror dims automatically for more comfortable night driving, and includes an integrated digital compass and HomeLink controls. 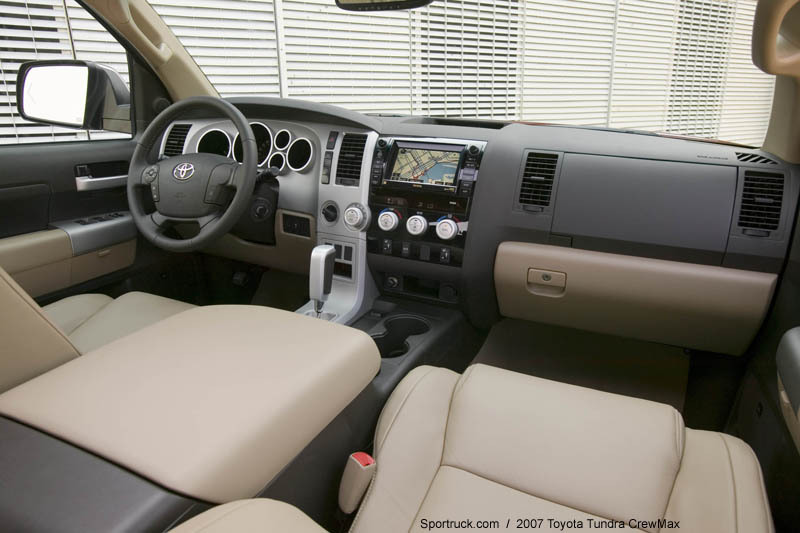 All Tundra models have standard front and rear seat side and roll-sensing side curtain airbags. 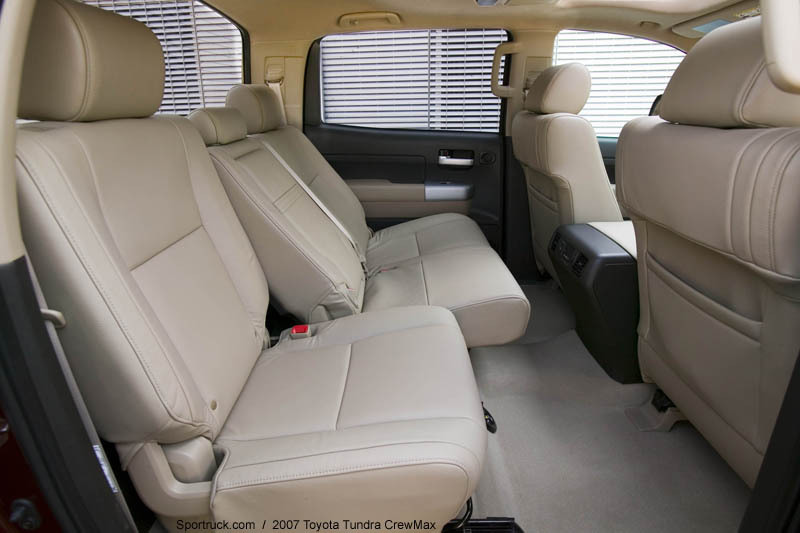 Three-point seatbelts and adjustable headrests for all seating positions are also included as standard equipment. 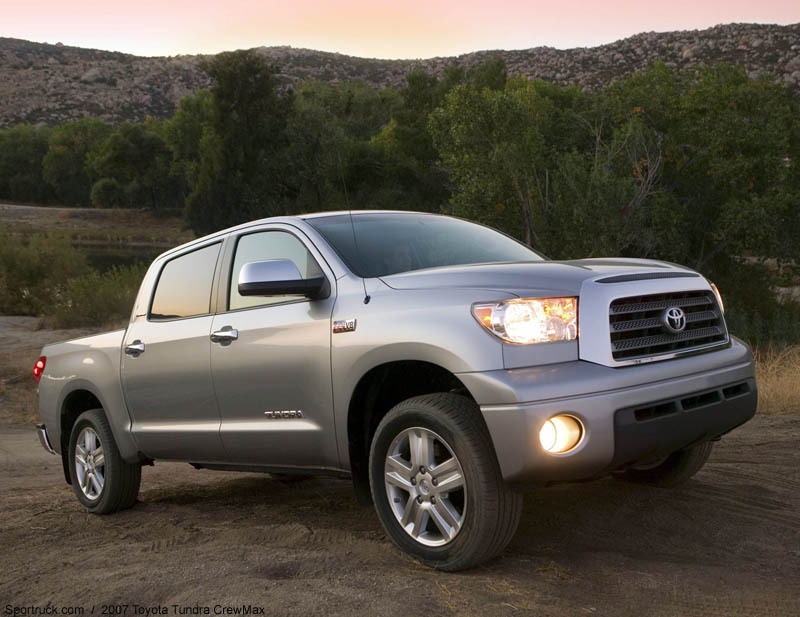 The Tundra receives Toyota's standard 36-month/36,000-mile warranty, with 60-month/60,000 mile powertrain coverage.